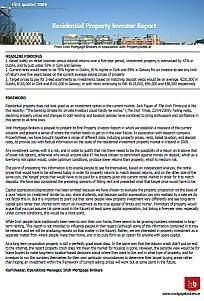 We are pleased to bring you, in association with Propertyweek.ie, the investment property report for Q1 2009. To download the report just click here, or on the picture to the left. The headline findings and information contained in this are based upon prices which are collated by Propertyweek, one of the most widely used valuer systems in the country, and financial calculations which were done by Irish Mortgage Brokers. Between the two companies we have combined our experience and knowledge in order to give an interpretation of the property market for investors. The basis of comparison is as follows: anything with risk should carry a ‘risk premium’ versus the returns available on ‘low-to-no risk’ options (such as deposit interest). If deposits are outperforming investment property then there is no reason to assume the additional risk, equally, if this isn’t the case then there is an argument in favour of investing in property. We hope you enjoy the report and if you have any questions feel free to contact either Paul O’Connor from Propertyweek.ie or Karl Deeter (that’s me!) of Irish Mortgage Brokers, our contact details are at the end of the report. 4% is a market leading 5yr fixed deposit rate, because you don’t have to be underwritten for a deposit (no bank applies criteria other than money laundering requirements) you can go with a market leading rate. The idea is that there is (or should be) a risk premium, and therefore it should [property] beat deposits by a long shot to attract investors. One of the problems is that deposits are well above normal margins because banks are trying hard to improve their capital position, so in a way this is unique, if the market was more rational they would be closer to the 2% mark, having said that, nothing – and that includes the property market – is very rational so we tried to gauge a 5yr outlook versus something that is set in stone and comparative. btw: if you have any ideas for how we can improve the methodology used please be sure to call and ask for me, do you think it would be of use to do comparisons at different deposit rates? Because 4% is the best and you don’t need to ‘qualify’ to get it we thought it made the best sense as a real world interpretation. Thanks for this analysis. I have a couple of questions. How is the tax due calculated? 49% of 2372.68 is 1162.61 and not 1119.91. Also, how is your profit/loss per annum derived? There is a pre-tax annual profit of 180.24 and a tax charge of 1100, so how does that give an annual loss of €2139.66? Management charges are surely a significant cost for an apartment investor. 2k per annum in Dublin. Liability insurance? The 100/month sundry charge would cover a property management charge but another 100/month would be needed for finding and vetting replacement tenants, checking inventories, handling deposits etc. There is no figure for depreciation. After 20 years, even the kitchens and bathrooms need replacement. More frequently, cash needs to be set aside for repainting, replacing carpets and so on. – tax due on the rental profit. if you go through the figures it creates a loss in taxation, but there is also an outlay of cost that gets factored in which increases that issue because you can’t forget to factor in the cash flow loss. Regarding the mgt fees/insurance, c.€100 is what we opted for, sometimes its more sometimes less, and in management fees there is insurance (block policy). On the replacement of tenants – that is why there is only 11/12ths of rent considered. You’re deposit rate appears to be 4% – if so it seems that annual capitalisation should be net of DIRT – if so it will reduce total after tax interest earned. Hi Bill, the deposit rate 4% with dirt applied at 23%, the dirt was applied each year rather than after yr5 as you have suggested, it probably looks otherwise because I put it in as a ‘total’ but that was down to layout more than anything. If we had overlooked that though it would have skewed the figures. As an Ex Pat living in Chicago for the last nine years I find it fascinating to watch whats going on in the property market in Ireland at the moment. This may be somewhat off topic but I’ll note some observations for those that care to hear. In Chicago (approx 8 million)I’ve witnessed the rise and fall of the residential Real Estate market since 2000. Right now private investors are buying the place up at discounts I honestly didn’t think were possible. It seems as though theres been an over-correction in the market and people are taking advantage. Does anyone think something similar is going to happen in Ireland? What actually happens when someone defaults on their mortgage payments? Whats the foreclosure process? Does it a judicial process? I’ve been investing in foreclosures for the past three years and the foreclosure system banks have adopted is really quite brutal. In the same breath I’ll should say that as well as the banks misbehaviour, fraud, on a grand scale, contributed to the situation here. I don’t know if mortgage fraud was common in Ireland? Lending guidelines here are so tight these days. 80% LTV is here to stay. This of course narrows the buyers pool, sustaining the low prices. These days Warren Buffet is buying up mobile home parks. At first I thought this was quite strange. I’ve researched his background since and found that he’s often quoted: “When theres blood in the streets, buy real estate, even when the blood is yours”. If I had a million euro to invest in Ireland, I’d go into the second or third worst neighborhood in every town (nobody wants the worst)and buy everything I could, including land. This may seem mad, but new construction is dead and cashflow is all that matters now. I’ve seen luxury homebuilders reinvent themselves and adopt this strategy to survive. Well this is really a three hour conversation so I’ll go no further than that. I’ll be heading to Ireland next week and will probaly be spending many hours drinking coffee and pouring over newspapers in Easons so I hope to be more educated at that point. I am an ex-pat (of sorts!) of Chicago, lived there from 98 – 01′. The likelihood is that with any market, real estate or otherwise, the correction goes below the real bottom in the same way that the bull run went over the real top. I think that there is always a bull market somewhere! You just need to find the right opportunity and property is certainly deep enough in the doldrums to be an opportunity in many areas, good luck with the foreclosure deals, let us know how you get on! Regarding foreclosure here, we wrote a comprehensive report called ‘A repossession guide for irish homeowners’ and everything you might want to know about the law and process in Ireland is in it, free pdf download. google it if you want to have a read.